As Jeremiah and I set out for my last day of the late archery deer hunt I was cautiously optimistic. 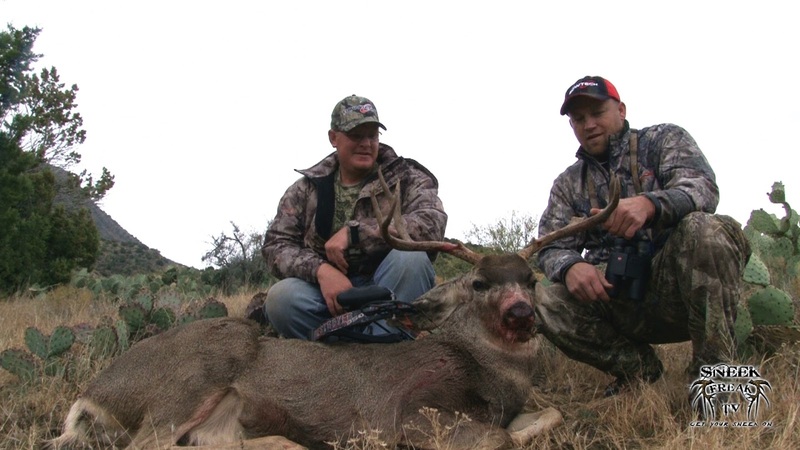 Success on mature bucks in the desert with a bow is hard to come by and we had already used up a lot of good luck the week before when Jeremiah connected on this stud buck. The morning started slow. We had glassed a herd of whitetail does and also a herd of mule deer does. For the next hour we continued to scour the rolling hills while occasionally checking back on the does to see if a buck had joined them. Finally a small buck appeared with the mule deer. It was nice to see some horns, but not quite what we had pictured chasing. While watching this small buck chase the does around, Jeremiah noticed a doe running out of an obscured draw below the herd. Following right behind her was a mature buck! He wasn't a monster, but with nothing else happening, we decided to make a play on the buck. We hiked off our glassing spot and were actually able to drive the truck to within about half a mile of where we had last seen the buck. As we crept up the last little ridge between us and the deer, we were excited to see that the herd was still there. At that point we turned on the camera and Jeremiah was able to capture the hunt on film.